Playing with shapes, objects, spaces ... What does a shape hide? What does it contain? What surrounds it? 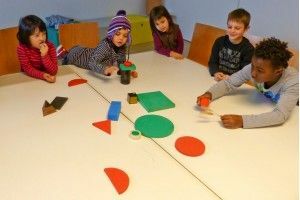 A workshop for children who wish to experiment with the creative possibilities of art, sculpture and architecture based upon everyday materials. Children 6 to 10 years who wish to play and experiment with the creative possibilities of art. 25,00 € (20,00 € for Friends of ACVic and members of H. Associació per a les Arts Contemporànies). Registration will be open until Tuesday 22nd December, 2015, and may be made by application form in the website, or by calling to book on 93 885 37 04. Places are limited. Each session will be from 10 am until 1.15 pm. Will take place at ACVic Centre d’Arts Contemporànies (Sant Francesc, 1 Vic). Session 1 - What does a shape hide? Based upon observation of the surroundings, the activities are geared towards making participants think about the shapes of objects and spaces. We will visit the current exhibition at ACVic, Economies del Desgast, to see how two very different artists see this issue . Play with soft materials, to understand the importance of both negative and positive, and full or empty. Session 3 – What surrounds a shape? A large construction using shapes created by each participant. Playing with lights, projections, mirrors, colours, etc..
Old clothes, which you won't mind getting dirty, are an absolute must, and it is also recommended that children bring a mid-morning snack. We encourage you to gather blister-packs and plastic containers, which we'll use as moulds and start work right away!